Hawthorne's novel of Americans abroad, the first novel to explore the influence of European cultural ideas on American morality. Although it is set in Rome, the fictive world of The Marble Faun depends not on Italy's social or historical significance, but rather on its aesthetic importance as a definer of 'civilization'. As in The Scarlet Letter, Hawthorne is concerned here with the nature of transgression and guilt. A murder, motivated by love, affects not only Donatello, the murderer, but his beloved Miriam and their friends Hilda and Kenyon. As he explores the reactions of each to the crime, Hawthorne dramatizes both the freedoms a new cultural model inspires and the self-censoring conformities it requires. His examination of the influence of European culture on American travellers lay the groundwork for such later works of American fiction as Mark Twain's The Innocents Abroad and Henry James' The Portrait of a Lady. Ticknor and Fields, Boston, 1860 First Editions, First Printings. A wonderful copy of this (2) volume set with ALL the First Issue points including the 16 pages of ads dated February 1860 at the end of volume I, page ix of volume 1 has the signed "1* and there is a preface placed before table of contents in volume 1. Both books are bound in the ORIGINAL publisher's brown cloth. The bindings are tight with minor wear to the boards. The pages are clean with NO writing, marks or bookplates in the book. A lovely copy in collector's condition.. 1st Edition. Hardcover. Fine. First Editions, First Printings of each book in this two volume set. Each book is bound in the publisher's brown cloth with light wear to the edges. The bindings of both books are tight with NO cocking or leaning and the boards are crisp. The pages are clean with a small matching bookplate in each book. There is NO writing or marks in the book. A wonderful set with the ads present in the back of volume 1. Boston, MA: Ticknor and Fields, 1860. First edition. Hardcover. Very Good. Complete in Two Volumes. First Edition, First State. Ads in rear of first volume dated February, 1860, no 'Conclusion' in second volume. Hardcover. Blind embossed brown cloth, gilt spine titles. 8vo. 283pp. + 16pp. publisher's list in rear / 284pp. Very Good. Lightly rubbed at spine-ends and corners, previous owner's bookplates inside front covers, occasional mild foxing to contents. Boston: Ticknor and Fields, 1860. A First Edition, First Printing. Hardcover. Very Good. Two volumes. Finely bound in plum colored half morocco (Scroll Club, NY). Gilt rule on cloth sides, raised bands, spine compartments with elaborate gilt decoration, top edges gilt. SIGNED by Hawthorne on a paper glued to the front endpaper, opposite his photograph also glued in. Corners just a bit rubbed, a few very minor spots and stains internally, else fine. Appears to be a mixed state, with the "Preface" before the "Contents" page, but with "for" instead on "on" on page 225, line 22 of Volume 1. Signet Classics, 1961-12-01. Mass Market Paperback. Used:Good. Ticknor & Fields, 1860. Book. Fine. Hardcover. 1st Edition. 12mo - over 6¾ - 7¾" tall. 2 Volumes First Edition Second State.Ads Dated March Instead of Feb. Gorgeous Fresh Fine Copies.Very Rare In This Condition..
Boston: Ticknor and Fields, 1860. Hardcover. Very Good/No Jacket. Cloth, two volume set. First printings. Attractive set. Boston: Ticknor and Fields, 1860. First edition. Old paper clip impression to front endpaper and first few leaves of first volume, no loss; light rubbing; gilt stamping only slightly dulled.. Two vols., 8vos, 283, 284pp + publisher's ads at end of first volume; brown cloth. Second state of publisher's ads, dated March 1860. Boston: Ticknor and Fields, 1860. Two volumes. Original brown cloth, stamped in blind and gilt. Patch of dulling in corner of lower cover of first volume, minute nicks at spine ends, otherwise an unusually tight, bright set. Half morocco slipcase and cloth inserts. First U.S. edition, first printing (signed as 12s, but gathered as 8s). Inserted catalogue dated March. BAL 7621. CLARK A.23.3.a. WRIGHT II:1136. BLEILER, p.96. Boston: Ticknor and Fields, 1860. First Edition, later printing. Two volumes. Small 8vo, pp. xi, 283; 288, 16. Brown cloth, blind stamped, with gilt lettering on spines. Covers somewhat worn at corners and spine, o/w VG. With a 16 page Ticknor & Fields catalogue inserted in the rear of volume 2, dated September, 1860. BAL 7621; Clark A23.b. "Preface" precedes "Contents" and "1*" signature on p. ix is not present. Boston: Ticknor and Fields, 1860. These are Very Good (Plus) copies of the First Edition. Original brown publisher's cloth binding, decoratively stamped. Gilt titling on the spines. Volume One is xi, begins with page 15 and continues to page 283, with sixteen pages of publisher adverts in the rear (dated March 1860). Volume Two begins with Page Seven and continues to Page 288. Very mild wear: light bumping, rubbed head and foot of spines. Volume One has a tiny hole on the lower front edge of the spine. A very solid set of this classic of American literature.. First Edition. Hard Cover. Very Good (Plus)/No Jacket. 12mo - over 6¾" - 7¾" tall. Boston: Ticknor and Fields, 1860. First edition, second printing. Hardcover. 283; 16; 284pp. Duodecimo [19 cm] Original brown cloth with blind stamped designs on the spine and covers, and gilt stamped titles on the spines. Good. The extremities are gently rubbed, and the spines are rolled. Minor fading to the extremities. The spine ends and corners of the covers are bumped. The underlying boards are exposed at the corners. are several very small splits in the cloth at the spine ends. The front free endsheets have a contemporary owner's name, along with a date, in faint pen. The endsheets are very subtly stained, and the front free endsheet of volume 1 has multiple small areas of abrasion and several thin dark stains. There are numerous very tiny dot-like stains on the bottom edge of the text block of volume 2. The text blocks are cracked multiple times, and the underlying cords are visible in many of the margins, and along the hinges of the endsheets. Browned pages. Nathaniel Hawthorne is most known for his gothic romance, The Scarlet Letter. He was friends with some of New England's finest intellectuals including Amos Bronson Alcott and his daughter Louisa May Alcott, Henry David Thoreau, and Ralph Waldo Emerson who was also well known in the Transcendentalist movement. HAWTHORNE, Nathaniel. The Marble Faun: or, The Romance of Monte Beni. 2 vols. Orig. cloth (extremities rubbed). Boston: Ticknor & Fields, 1860. First edition. A very good set. Boston: Ticknor and Fields, 1860. These are Near Fine copies of the Second Impression of the First Edition. Original brown publisher's cloth binding, decoratively stamped. Gilt titling on the spines. Volume One is xi, 283 pages, with 16 pages of publisher's adverts in the rear, dated March 1860. The Table of Contents precedes the Preface. Volume Two has 284 pages. A bit of rubbing to the head and foot of the spines; Volume Two has a tiny chip at the top of the spine. Gilt on spine somewhat dulled but perfectly readable. Withal, quite attractive copies of this high spot of American literature. In archival plastic covers.. First Edition. Hard Cover. Near Fine/No Jacket. 12mo - over 6¾" - 7¾" tall. The Marble Faun: or, The Romance of Monte Beni. hardback. Fine. 2 vols. 1st edition, 2nd printing (with adverts dated March 1860) Boston (Ticknor & Fields) 1860. Very slight spine wear else a fine pair. Boston: Ticknor and Fields, 1860. First Am edition. Hardcover. Very good. Two volumes. 283, 288,16 pp. Original brown cloth with blind stamped design; gilt title to the spines. Some rubbing and wear to the boards; extremities. Spines lightly sunned. Previous owner's name in pencil on the ffep of volume II. Age toning to the fore edges. Internally fine. Boston: Ticknor and Fields, 1860-01-01. Hardcover. Good. . Volume I only. Boston: Ticknor and Fields, 1860. Hardcover. Very Good. Original brown cloth, rubbed, cloth a little bubbled on rear board of volume two. Nice tight copies. Contemporary gift inscription to a Mary E. North. First edition, second issue: publisher's 16-page catalogue, dated March, 1860, at rear of Volume I. Two volumes housed together in a deluxe custom 1/2 leather boxed slipcase. Hard to imagine a finer box for this set. 1860. HAWTHORNE, Nathaniel. The Marble Faun: or, The Romance of Monte Beni. Original blindstamped cloth. Boston: Ticknor and Fields, 1860. 2 Vols. First American edition, issued simultaneously with the British edition. BAL 7621, printing 1 of both vols. Wright II: 1136. Catalogue in Vol. One dated March. Some wear to spine ends and corners, very light uniform toning, else very good. Boston: Ticknor and Fields, 1860. First Edition. Hardcover. Good. 12mo. First edition, later state. 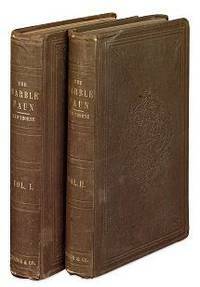 2 volumes: xiv, 15-283 pages,  blank pages, 16 page publisher's catalog of books dated March 1860,  blank; , 284 pages, . Brown cloth hardcovers with blind stamped boards and gilt lettered titles on the spine. Cloth is edge worn head and base of spines and corners. Toning to the paper. Armorial bookplates of "Parry" on the front paste downs with the name Richard R. Parry written on the bookplates, half title pages, title pages and page 7 of volume 2. THE MARBLE FAUN: OR, THE ROMANCE OF MONTE BENI ..
Boston: Ticknor and Fields, 1860. First US edition, first printing. 12mo. pp. , -283; -284. . With March 1860 catalogue in the back of vol. 1. Brown p. 47. Bound in brown cloth, worn at the extremities of the spines, rear hinge of vol 1 loose, a very good set. BAL 7621. Boston: Ticknor and Fields, 1860. 1st edition - later printing. Very good copy in the original gilt-blocked cloth with blind-stamped decoration and blind-ruled border to front and rear boards. Spine bands and panel edges slightly dulled and dust-toned as with age with corners slightly bumped and frayed. Decorated floral endpapers. Professionally rebacked with the original spine laid back; very impressively finished. Remains particularly well-preserved overall; internally tight, bright, clean and strong. Very minor pen annotation to title page of volume 1. ; 8vo 8"" - 9"" tall; 2 pages; Physical desc. : 2 vols (xi, 283, 284, pp) 19 cm. Subject: Americans -- Italy -- Fiction. Women art students -- Fiction. Artists -- Fiction. Summary: Befriended by Donatello, a young Italian with the classical grace of the 'Marble Faun', Miriam, Hilda, and Kenyon, three American expatriates, find their pursuit of art taking a sinister turn as Miriam's unhappy past threatens to lead them into tragedy.. Condition: Very good copy in the original gilt-blocked cloth with blind-stamped decoration and blind-ruled border to front and rear boards. Ticknor & Fields. Very Good with no dust jacket; Both volumes show some expected wear to . spines and board corners, primarily cloth loss to spine ends (varies, but . ave. approx 1/3" to 1/2" top/bottom), w/some closed vertical tears and in . spots at spine edge w/moderate rubbing to board corners; faint 1894 . previous owner name/date to first blank; Vol I w/browning to 1/2" upper . corners, else leaves about FINE. Vol II, but for a few fox marks, leaves . essentially FINE.. 1860. First US Edition; Fourth Printing. Hardcover. PREFACE PRECEDES CONTENTS; PUB. ADV. ARE MARCH, 1860 at rear of Vol Fully bound brown cloth -- original publisher, NOT rebound! -- over boards . W/GILT stamped lettering to spine; and blind stamped decorations and blocking to front and spine. Vol I: 283pp; followed by 16pp pub. adv. ; Vol II: 288pp. Brown coated endpapers.I. ; 8vo; With the conclusion added for the fourth issue demanded by readers of the 8000 copies of the first three issues... .
Boston: Ticknor and Fields, 1860. First Edition; first printing. Two volumes in publisher’s cloth; some wear; a good set. Condition: First Edition; first printing. Two volumes in publisher’s cloth; some wear; a good set. Zürich: Fritz Brothers, Zürich, 1931. Limited Edition. Hardcover. Near Fine/Very Good. 12mo - over 6¾ - 7¾" tall. Carl Strauss . Signed by Illustrator(s). 1st Printing 2 Copyright date 1931, limited edition, printed for The Limited Edition's Club By Fritz Brothers Zürich 1500 copies, this copy is number 429 and it is signed by Carl Strauss the illustrator. Brown cloth over boards with gilt lettering on the spine on the brown label. Gilt top page edges brown inside covers front and back no tears, bent pages, nor any writing. Slipcase brown cover with gilt lettering on the glued on label on the spine. Slipcase shows wear and some soiling, structurally. Sound. Boston: Ticknor & Fields, 1860. First. hardcover. very good. 2 vols., original blind stamped cloth, chipped at extremes of spines & corners; spine lettering faded. bookplate. Boston, 1860. First Edition. First issue. BAL 7621. Ownership signature of Ellen (S)turgis Hooper, Beacon Street. A relative of the American poet of the same name. member of the Transcendental circle, who died young. Unrelated book-plate. Boston: Ticknor and Fields, 1860. Two volumes. Original brown cloth, stamped in blind and gilt. First U.S. edition, first printing (signed as 12s, but gathered as 8s). Inserted catalogue dated March. Two lower forecorners bumped, some small nicks at head and toe of spines and corners, dated 1860 ownership inscription on each front free endsheet (one faint in pencil, the other bolder and partially erased), otherwise a bright, tight set. BAL 7621. CLARK A.23.3.a. Boston: Ticknor and Fields. Hard Back. march 1860 printing with book list at back of volume 1 dated march 1860. nice solid set. hinges tight. tiny ewar head and heel of spine of volume 1. tiny wear heel of spine of volume 2. volume 1 points worn. blindstamping nice.gilt lettering on spine bright. books lighti\ly cocked. presentable set of my favorite work by hawthorne. . Very Good. 1860. First Edition Second State. Boston: Ticknor and Fields, 1860. First edition. Hardcover. Very Good/No Jacket. 2 volumes set. 1860, First Edition, second state. Hardcovers, brown cloth, gilt title. Very Good copies in 2 piece custom slipcase. Top 1/4-inch of the spine cloth of Volume 2 has been restored; otherwise the bindings are original with only minor edgewear. Pencil notes on the endpapers; less than 5 pages have pencil checks in the margins. Tight bindings. Cloth slipcase includes chemise and box, as well as leather and gilt title label. Slipcase Near Fine, with minor scratching and joint wear. Digital images available upon request. Zurich: Limited Editions Club, 1931. Hardcover. Fine in a Near Fine slipcase with small splits at the bottom. Carl Strauss. Two duodecimo volumes (4-3/8" x 7") bound in full flexible tan tweed with gold-stamped orange cloth labels. Illustrated with etchings by Carl Strauss printed in gravure and hand-colored. Copy #834 of 1500 SIGNED by the artist on the colophon page. Monthly Letter laid in. 2010-08-04. Good. Ships with Tracking Number! INTERNATIONAL WORLDWIDE Shipping available. May not contain Access Codes or Supplements. May be ex-library. Shipping & Handling by region. Buy with confidence, excellent customer service! Boston: Ticknor and Fields, 1860. 2nd edition (BAL 7622). Original publisher's brown cloth binding with gilt stamped title lettering to spine & boards stamped in blind. Bindings worn. A pulled gathering in Vol I. In each volume, Vidor's inscription "Library of King Vidor" [blue ink] to preliminary blank & Vidor's blindstamp to title leaf right margin. Period pos to half-title page ["D E Gill"]. Vol II lacks lower corner of rfep. A Good set.. 2 volumes (xi, ,  - 283, [5 (blank)], 16; 288, [2 (blank)] pp). May 1860 catalogue concludes Volume I. 12mo. 7-3/8" x 4-3/4" Vidor "an American film director, film producer, and screenwriter whose career spanned nearly seven decades. In 1979 he was awarded an Honorary Academy Award for his 'incomparable achievements as a cinematic creator and innovator.' He was nominated five times for a Best Director Oscar, and won eight international film awards during his career." [Wiki]. One "... of Vidor's unproduced projects, a quite faithful adaptation of Nathaniel Hawthorne's The Marble Faun, reminds us of their affinities. Hawthorne too, was a melodramatic moralist ... American optimism made the concept of sin very touchy and reproachful. But for both artists, 'sin' is usually redemptive. Vidor's script (first drafted, with Harry Behn, in 1954, and at one time titled The Sinner) centers on Hawthorne's Miriam and thus would have extended Vidor's postwar line of perhpaps-justified murderesses -- Pearl in Duel in the Sun, Rosa in Beyond the Forest, and Ruby in Ruby Gentry." [Durgnat & Simmon. King Vidor American. 1988]. A nice bibliophilic memento, which connects the 19th C American literary giant Hawthorne, with the 20th C film giant, the renowned Hollywood director, King Vidor. Boston: Ticknor, 1860. First edition, second printing. Two volumes, original brown cloth, ends of spine frayed, one gathering loose in v. 2; a good set in original state. Conforms to Clark's plate variant "B" (A23.3.b). CAMBRIDGE: RIVERSIDE PRESS. 1889. 2 VOLS. LIMITED EDITION #4/150. BOUND IN VELLUM. BINDINGS ARE SPOTTED, GILT DECORATED, PAGE EDGES ARE FOXED. OVERALL ABOUT VG. .
20120314. Good. Ships with Tracking Number! INTERNATIONAL WORLDWIDE Shipping available. May not contain Access Codes or Supplements. May be ex-library. Shipping & Handling by region. Buy with confidence, excellent customer service! 20160517. New. Ships with Tracking Number! INTERNATIONAL WORLDWIDE Shipping available. Buy with confidence, excellent customer service! 1996-01-30. Good. Ships with Tracking Number! INTERNATIONAL WORLDWIDE Shipping available. May not contain Access Codes or Supplements. May be ex-library. Shipping & Handling by region. Buy with confidence, excellent customer service! 20101015. Good. Ships with Tracking Number! INTERNATIONAL WORLDWIDE Shipping available. May not contain Access Codes or Supplements. May be ex-library. Shipping & Handling by region. Buy with confidence, excellent customer service! 2012-04-09. Good. Ships with Tracking Number! INTERNATIONAL WORLDWIDE Shipping available. May not contain Access Codes or Supplements. May be ex-library. Shipping & Handling by region. Buy with confidence, excellent customer service!